It's starting to get ungodly hot here in Iowa, as I'm sure everywhere else is feeling the same way. I love the heat, it's that humidity that makes it unbearable. The only way I want to be outside, is if I'm floating in the pool with a drink in my hand. In fact, we did that for two hours yesterday afternoon and it was great! Along with not wanting to be outside much, it's hard to want to turn on the oven or stove to do any cooking. In our house, the kitchen, dining room and living room are all open and run together, so it can heat up quickly in those areas if I have the oven going. It's wonderful in the fall and winter, but not so much during this heat of summer. So we're trying to eliminate using the oven as much as possible right now. One night I set up a fun little build your own taco bar, we even sat outside on the patio to eat, even though it was starting to get humid. But it was nice and the kids enjoyed it. I did heat up the taco meat on the stove, but if it would have been in the 100's like these past few days, we would have most definitely gotten out the crockpot and let the meat cook in there all day long. You can also brown it up before bed the night before, when it's not quite as hot. 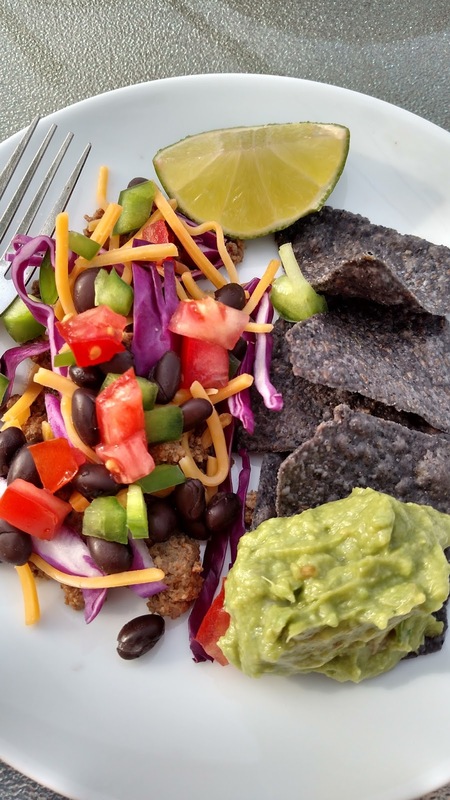 Or simply go for a meatless meal and leave that out, black beans provide more than enough protein for your meal. The idea is to set up small bowls of your favorite taco toppings, letting each family member build their own taco or salad. I did splurge on some Doritos for walking tacos for the kids, we had tortilla shells and I settled for a few blue corn chips to go along with my guacamole. I also have a big head of cabbage in my fridge that we've been slowly using up this week. Instead of purchasing more lettuce, I sliced the cabbage up. It provides more nutrition, more crunch and, it's so much prettier on your plate than green lettuce. We do this sort of thing frequently in our house, and not just in the summer, but throughout the year. Because really, who doesn't love tacos? If you've got a party coming up in the future, or want to get together with friends. Consider a build your own taco bar. It's a hit among adults and kids. Everyone will go home happy! Peel and pit avocados, mash them with a fork in a medium bowl. Squeeze in juice from the lime and garlic, mix together. Mix in all other ingredients and season with salt and pepper. Taste and adjust seasonings if needed. Serve immediately with chips or let chill in fridge until ready to serve.